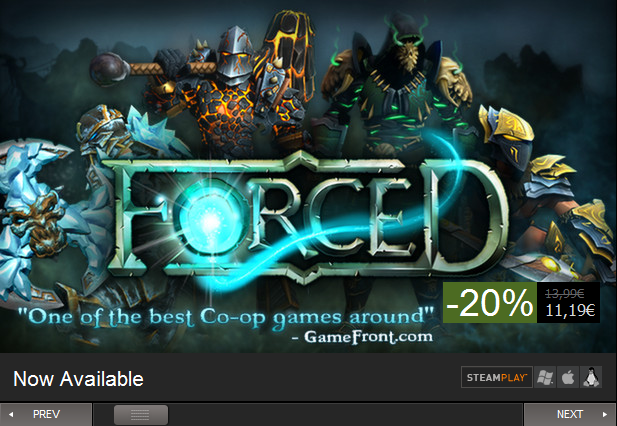 FORCED is finally available on Steam! Remember all those developer diary videos that I kept posting on my blog several times? I also commented about how the game was on Steam Greenlight, and on social networks I posted about the game having a Kickstarter campaign. Back then I was doing some of Danish game developer BetaDwarf’s first company videos and helping out here and there from time to time. But now the game is finally out on Steam! It’s also available in Spanish, courtesy of mine 😉 I was also in charge of contacting all the Spanish press prior to the release. In any case, you can now get your hands on this fun co-op game for Windows, Mac and Linux! The reviews so far are going great! Give the trailer a look below and enjoy!